Festival Report - Gaura Purnima 2016 ~ The Toronto Hare Krishna Temple! 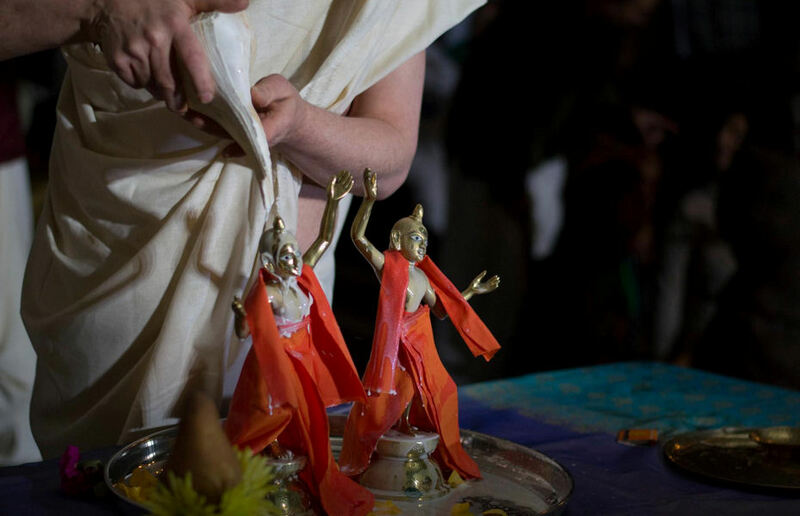 On a rainy, full moon Tuesday evening in March, devotees from Toronto's Hare Krishna community gathered to celebrate the advent of one of the most merciful forms of Lord Krishna - Sri Chaitanya Mahaprabhu! A packed temple, filled with reveling devotees exploded with colour, kirtan and the aroma of a delectable vegetarian feast. The evening began with kirtan (musical chanting) and continued with a class by Krsnadas Kaviraj das wherein he lovingly expounded on the appearance of Chaitanya over 500 years ago. He then weaved a beautiful picture of a famous pastime (story) of Chaitanya Mahaprabhu wherein He danced through the Jarikanda Forest, singing and dancing and the animals accompanied Him in the chanting and dancing as well. In seamless fashion, the next part of the program featured a parade of smiling children dancing their way into the Temple Hall, both costumed and face-painted as tigers, monkeys, rabbits, butterflies and foxes. They were led by an actor playing the role of Chaitanya amidst joyful kirtan. One glance at the audience was enough to prove that all hearts were melted instantaneously as the smiling children reenacted this most glorious story of Chaitanya Mahaprabhu! As the costumed-kids settled in, the grand abhisheka took over. The abhisheka was a special "bathing ceremony" wherein small Deities of Lord Chaitanya and Lord Nityananda were lovingly bathed in various items like yogurt, milk, honey and more! The walls resounded with kirtan as colourful lights illuminated the Temple Hall. A final kirtan (arati) was followed by a giant feast served for anyone and everyone! Spiritually contented, the community of devotees made their way home with memories of a very special evening dancing in the forest of their hearts!